The very dangerous reality that human kind has the potential to create technological potential that our societies will be divided on regarding how we should and shouldn’t use it, was enough to scare me of the hyper-individuality that I’d witness in the 20th century, and inspire all of the writing in Integrationalism. 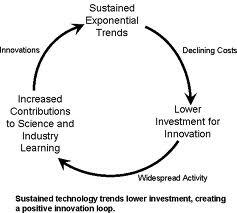 Ray Kurzweil talks above about exponential growth versus linear growth. Its actually very basic mathematics to the formally educated… The mathematical fact that something can be multiplied by itself instead of by some constant coefficient. Traditionally we’ve thought of growth as linear. we start with something (e.g. ‘1’), and build onto it by some constant (e.g. ‘2’) and so the series goes 1, 2, 4, 8,…n —> But our technological growth over the centuries (as long as we’ve managed to retain and control knowledge of existing technologies) has been exponential where (e.g. 2×2=4 and 4×4=16 and 16×16=256). While the growth is small in the beginning, at a point the body of things (technological knowledge in this case) starts to affect change at a vast sweeping rate. 256×256=65536 and 4294967296 and so on. Most of my sociologist and psychologist friend as me how could I be a technological determinist over being a social constructivist….and while I have a more fundamental argument that I will share in some later article, I’d sometimes like to use the exponents (exponential growth example) to show that technological progression outpaces social progression; further, making it unlikely that social sentiments influence our potential over the scientific outliers who better represent counterculture in their efforts design solutions to problems. It’s a bit elitist, eh? The picture in this post is from William Sims Bainbridge’s innovation model and shows the logical method by which technological solutions, where they be biological, computer based, IT based, or other, will engage us. When I consider the model and Kurzweil’s exponential growth, I’m a beyond worried about losing the brain potential of the nearly 7 billion people that will surely believe that nanotechnologies and the like are a direct result of magic. We should not take lightly that during our (what will seem like a) rapid explosion of technological ability we might lose the formerly humaistic connections formed during the present integration period of globalization. Will we use nanotechnologies as an information technology to continually update everyone on everything, generating a society of calculation instead of superstition?Regardless of if it is desirable or not, living in the know is theoretically inevitable. The valuable question is; how many of us will be there? Overall, the nation’s population growth for the decade slowed to 17.64% over the past 10 years from 21.54% in the decade to 2001. Literacy increased for the country as a whole—climbing to 74% from about 65%. At the turn of the 18th century and the burgeoning of the industrial age Thomas Robert, the renowned demographer of his day foretold that the population would not be able to outgrow the food supply while referencing the populations in London. Approximately 30 years later the refrigerator was invested in London by an America inventor Jacob Perkins. Similarly: The story of our lives is one of technological determinism. Technological innovation’s effect on society in the industry of food supply and preservation…the increasing literacy through technologies and living quality in the “emerging world” can be curbed if we allow the potential for self-actualization and quality of life to pervade the populations. Differently: The problems of technological distribution today do not result from any inherent scarcity, but an extrinsic brought upon by institutional scarcity. At current, we fight for existence like cells for energy or ignorant animals for intrinsically scarce resources…canceling each other out through protectionist (conservative) measures. Although we regularly show ourselves our technologically ability we rarely allow that ability to pervade our peer and peer groups to provide wide spread quality of life or rather, self-actualization where it could/should be. Human kind doesn’t have a population problem (yet); we do however, have a problem with recognizing the intrinsic value in other humans and consequentially we don’t differentiate well between intrinsic and extrinsic scarcity. Here in Integrationalism, we’ll be defining that value.